Why did I read this book: I am not exaggerating when I say that this is one my most highly anticipated books of 2014, and that I have been ridiculously eager to get my hands on a copy. When the UK publisher approached us about being a part of the release of this title, I was ecstatic. Her name is Melanie, although she wishes it was Pandora. She’s a very special girl, with pale, pale skin, and sharp eyes. Melanie’s world is small, like her: she has her cell, the corridor outside her cell door, the classroom, and the shower room. She hopes that one day she’ll be able to visit Beacon, the great city warded against the onslaught of hungries, or even just to go outside, but for now, she waits and follows the routine. Each day she is strapped in to her chair, taken to class, then back to her cell (she listens to music on Saturday, and then chow-time and shower time every Sunday). Miss Justineau is Melanie’s favorite teacher, and she makes the days worth it – Miss Justineau tells the class stories about Greek gods and legends, she reads them poems and books from before the breakdown, and she asks and listen to the childrens’ opinions. Melanie’s favorite days are Miss Justineau days. So life goes on for little Melanie. But one day everything changes, and the hungries and the human junkers from the outside world come tearing down their camp. Melanie is outside for the first time, with her beloved Miss Justineau by her side, but the world will never be the same. Like her favorite Greek myth – Pandora, the “girl with all the gifts” – Melanie will change the world. Before I properly dive into this review, I should note one very important thing up front, because I know there’s some confusion around what this book actually is about: The Girl with All the Gifts is, in fact, a zombie novel. The z-word isn’t ever used (“hungries” being the preferred terminology), but it is indeed a zombie apocalypse novel. The description of the book doesn’t make this point clear, but I don’t mind because, well, the discovery and the growing sense of unease presented in that first haunting chapter is totally worth it. Largely told from Melanie’s perspective (not in the first person, but filtered through her thoughts nonetheless), one starts The Girl with All the Gifts on uncertain footing. One doesn’t know what exactly is going on, or why Melanie – who by all accounts seems like an imaginative, clever, kind girl – lives in a cell and has to be strapped into a chair by terrified soldiers. Then, breadcrumb by breadcrumb, Melanie reveals unsettling facts – like the fact she only eats once a week, and unlike the children in the fairy tales she’s read about who eat cakes and chocolates, she only eats live grubs. You see, Melanie is not just any normal ten year old, but she’s not quite the same as the mindless “hungries” in the world outside, either. When most adult humans are infected with the deadly fungus Cordyceps, the delicate connections between brain cells are destroyed until nothing is left but the fungus’ single-minded urge to propagate (i.e through blood and saliva, finding new hosts at an exponential rate). Melanie, however, retains a genius-level IQ; she and her fellow classmates are all capable of learning and communicating, of cognitive development, of even possibly refusing the mindless hunger of the infection. This makes Melanie and her cohorts incredibly valuable to what remains of humanity, and the desperate need to find and develop a cure. This, of course, raises all sorts of ethical questions, and is the source of the underlying conflict in the book. Is it morally acceptable that Melanie and her fellow little hungries are lab subjects, ripe for imprisonment, observation, and dissection? For the good of the entire human race (or what’s left of it 20 years after the apocalyptic fall of civilization), is it ok to cut into childrens’ skulls? The moral quandary is presented without being ham-handed or too didactic, through two opposite points of view – that of Doctor Caldwell, who runs the experiment and has no qualms when it comes to cutting open subjects’ skulls, and that of Helen Justineau, psychologist, teacher, and deeply invested in the well-being of her students (whether they are technically living/human or not). The sentient zombie is a familiar humanizing trope, so you’d think that making thinking child zombies would be a cheap trick to develop sympathy and humanity – but I assure you it’s not. Carey does a brilliant job of making Melanie a sympathetic protagonist without falling into the trap of sticky sentimentality – you see, Melanie doesn’t know she’s not a normal little girl, and she certainly has no knowledge that she’s one of the monsters she’s learned about. 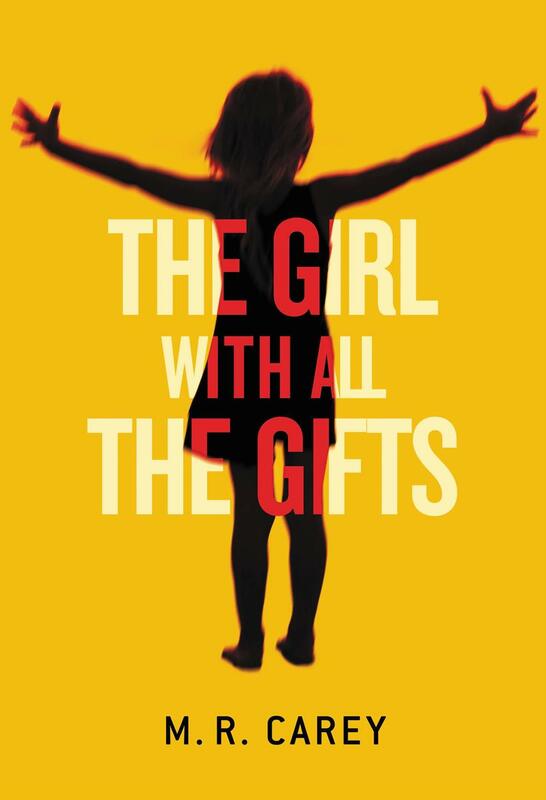 It’s Melanie’s narrative that drives this book, that makes The Girl with all the Gifts so moving; filtering the narrative through Melanie’s (and select other characters’) perspective makes her journey of self-discovery that much more profound. At the onset of the novel, Melanie’s narrative is sweetly, blithely oblivious; by novel’s end, she has seen and understood the world, and makes her choice for the future with ruthless compassion. While Melanie’s self-awareness changes over the course of the book, one thing that remains constant throughout is the love story. See, earlier when I said this was a zombie story, I also should have said that this is a love story. I’m not talking about a romantic love between a sentient boy zombie and a sweet human girl, I’m talking about the unconditional love that Melanie has for the one person who has expanded her mind and listened to her opinions. I’m talking the love between a child and her hero, Miss Justineau. And, by that same token, it’s the love story between an adult who cares deeply for a child, and will do anything to protect her. This trust and love is at the heart of The Girl with All the Gifts, and is one of the most compelling things about this remarkable book. Characterization beyond Melanie and Miss Justineau, however, isn’t quite as impressive as the rest of the book – the other lead characters are, essential, stock figures. There’s the (literally) scarred, rough-and-tumble military command figure; the green footsoldier yearning to impress; the doctor who will stop at nothing (hey, it’s FOR SCIENCE!). The characters behave in familiar, archetypal patterns, leading to what seems to be a fairly basic “find the cure” plot… but that’s where the good stuff kicks in again with a twist. I don’t want to spoil anything, but suffice it to say that The Girl with All the Gifts goes out in a blaze of glory, a burning funeral pyre for the world as it once was that is both devastating and hopeful. Even if I don’t want to live in that world, I certainly enjoyed the visit. In other words: this book is worth the hype, folks. Absolutely recommended, and already in the running for my best of 2014 list. Notable Quotes/Parts: Read excerpts of the novel by visiting the official facebook page HERE. This just got put on the top of my TBR pile, cannot wait to get my hands on it! I cannot understand how I was not aware of this book until now! Not sure how I will manage to wait months to read it! Normally I’m not interested in zombie culture, but the more I read about this book, the more I’m convinced that I need it in my life ASAP. I’d purchased and read the anthology (“An Apple for the Creature”) that the original short story was in. The story blew me away — and I normally HATE zombie novels and avoid reading them. Wow. I’m not usually big on zombies, but you’ve done a great job convincing me that not all zombie stories have to be mindless or violent. The discussion of what it means to be human seems to be central here, as it is in a lot of sci-fi or post-apocalyptic books. Thanks for the review. OMG too freaking funny. Reading this totally made me think of that X-Files episode too!